The 1.12 million-square-foot space is located in a new building at NorCal Logistics Center, representing continued expansion of logistics supply chain infrastructure against the backdrop of steady growth in e-commerce. STOCKTON, CA—Amazon is projected to exceed $250 billion in US e-commerce sales this year, a 29% jump from 2017 and well ahead of total US retail e-commerce growth of 16% for 2018, according to eMarketer.com. And, with talk of Amazon narrowing down locations for its second headquarters in the news of late, the e-commerce fulfillment giant continues to gobble up space here and around the country. This local space is mega, to the tune of 1.12 million square feet in a newly constructed industrial building at NorCal Logistics Center. This represents the continued expansion of the logistics supply chain infrastructure against the backdrop of steady growth in e-commerce. Terms of the lease were not disclosed. 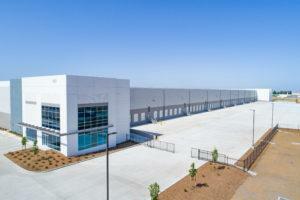 The transaction marks the completion of CT’s roughly 1.7-million-square-foot first phase at the 345-acre NorCal Logistics Center, following the sale of two completed buildings totaling 575,127 square feet to Prologis in July 2018. Located at 4532 Newcastle Rd., Amazon’s new fulfillment center benefits from proximity to Burlington Northern Santa Fe and Union Pacific intermodal facilities and is accessible to State Route 99, Interstate 5, Interstate 205 and Interstate 580, linking to all major Northern California markets and key Western US destinations. The project is home to General Mills, KeHE Foods, Allen Distributors and Fox Head, and is in the heart of the Central Valley, a 185-million-square-foot industrial market. The region is an extension of a global logistics supply chain infrastructure that links to West Coast ports in Oakland/Stockton, Los Angeles/Long Beach, Portland, OR and Seattle/Tacoma, WA. E-commerce remains a key driver for industrial space demand regionally, backed by strong demand for goods from the populous Bay Area. The Central Valley with its availability of land and proximity to waterways, rail lines and truck transportation is a compelling solution for new supply, according to eMarketer.com. The transaction marks CT’s second lease with Amazon this year. The e-commerce giant also leased a 395,099-square-foot lease at Southport Logistics Park in South Dallas, a CT venture with Port Logistics Realty and Diamond Realty Investments. CT is underway on the second phase of development at NorCal Logistics Center, with five buildings totaling 2.7 million square feet that will be built as a mix of spec and build-to-suit projects. CT is also in development on 1.3 million square feet of large-scale distribution buildings at Interchange 55 Logistics Park in the greater Chicago area, and is developing logistics centers in Atlanta, Dallas and New Jersey. The company’s current land holdings support the development of nearly 15 million square feet of industrial buildings during the next five to seven years, and CT is actively seeking additional land holdings in 2018 for further expansion. CT was represented in the Stockton transaction by Kevin Dal Porto, John McManus, Blake Rasmussen and Tyson Vallenari of Cushman & Wakefield.